I recently attended the Aula 2006 event in Helsinki, and as promised, as well as the slides-as-PDF to download, see below and you'll find the fully written-up and illustrated version of the 8-minute talk that I gave. The talk offered me a chance to road-test an unformed idea, growing out of previous writing here but also partly informed by my 'day job' at the BBC. It's slightly more explorative or theoretical - though without theory, thankfully - than the usual pieces here. 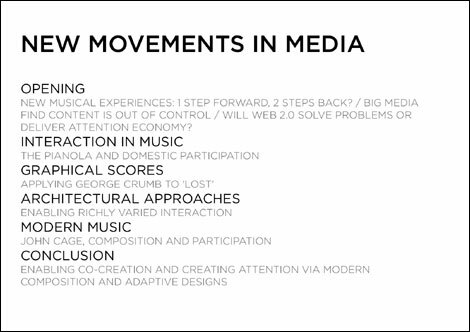 Those of you who have previously read the 'New Musical Experiences' and 'Why Lost is genuinely new media' pieces will see elements of those re-used here. Fear not, there is some new material, not least because I actually changed my talk at the last minute. I'd suggested to Marko Ahtisaari, curator and host-supreme, that I'd do a revamp of my New Musical Experiences talk, but decided to switch to some more recent concerns and an almost last minute series of thoughts about John Cage. Thanks again, Marko, for your gracious acceptance of my variability! I last spoke in Helsinki in September 2005 at the Sibelius Academy [written up article here]. The broad point there is that for all the advances in the contemporary digital experience of discovering, listening to and sharing music, there are a number of potential steps backward too. For example, loss of important metadata, diminished visual and aural experience, increased obsolescence of format, digital rights management generally hindering social activity around music and so on. However, thanks to the internet, the possibility of meaningful interactive context around music is enhanced and increased. Since then, much talk in new media has revolved around concepts of 'Web 2.0' and 'attention economies'. The paucity of thinking in both of those worlds is often frustrating. Pure Web 2.0 media models don't allow for much in the way of composition or orchestration towards a particular arc - other than the sub-set of activity facilitated by emergent behaviour. It's often a case of "if you build it, hope they'll come" whilst implying most previous systems of organisation are either irrelevant or out-of-control. Talk of an attention economy invariably concerns itself with how bottom-up organisation might reinforce bottom lines, and little else. I'm not sure that 'attention seeking' is a theme we really need to be encouraging at this point, particularly around the contemporary media. So I wanted to look at a couple of ways of organising or articulating movements in media, without losing the intrinsic power of out-of-control media ... to plot a course between between the top-down, fully-articulated, designed, broadcast models and the fully-participative, emergent, vernacular, bottom-up, open-ended models. Essentially believing there is some value in both, and lots in their potential fusion. Ideally, this would be something beyond simple 'push versus pull'. I've been looking for potentially useful analogies as a result. The purpose of these analogies is to suggest alternative ways of thinking, to spike preconceived ideas with previously unrelated examples, in the hope that these 'spikes' will stimulate some thoughts in your own mind about a different stance with which to approach this new landscape ... So the form of the talk itself is a reference or example of the content - to present something half-thought-through, with the responsibility therefore on 'the audience' at Aula to co-create fully realised thoughts and actions. So my broad question is this: given that content is effectively out of control, how can media organisations still thrive in this new media environment? How might such organisations, from Big Media through to small media, including the music industry, capitalise on an environment with different models of control and attention? What are the characteristics of a different approach to thinking about media and particularly the design of such industries? I'd like to look at a couple of practical ideas, based around a case study from TV and some early thinking around the 'BBC 2.0' project I'm working on, via analogies with architecture and modern music. With the examples previously discussed in New Musical Experiences, we can see something of a model here: an industry struggling with a participative media, occasionally innovating but often attempting to wrestle control back, whilst the game is now being played elsewhere, to another set of rules altogether. And yet, music is a particularly fruitful area to look at in terms of participative media. One hundred years ago, music making was a far more participative activity. Your average punter would often engage in music making - no matter how 'unprofessional' the results. It was relatively common to have pianos, guitars, fiddles, whistles, drums, pipes or equivalent in homes, pubs, churches or other focal points within the community. Music making was a distributed activity, in this sense. The player piano [At this point in the presentation I unfurled an old pianola roll - more images here] is an example of a somewhat disruptive early music technology, with many analogues in code if you look at it in a certain way, which enabled a fair amount of user control and participation. It was relatively 'hackable' to use a contemporary reference. Intriguingly, this technology was pounced upon by modern composers such as Conlon Nancarrow, and arguably informed the later 'prepared piano' work of John Cage, George Antheil et al. As the music industry emerged over the course of the 20th century, this form of 'domestic music making' faded somewhat, receding in the shadow of a newly industrialised professional music practice. That personal, participative, highly interactive practice subsided to a trickle of 'amateur activity', compared to the flood of high-quality music being released by the music industry. Oddly though, participative, interactive music continued to be pursued in the somewhat unlikely and rarified world of contemporary composers. 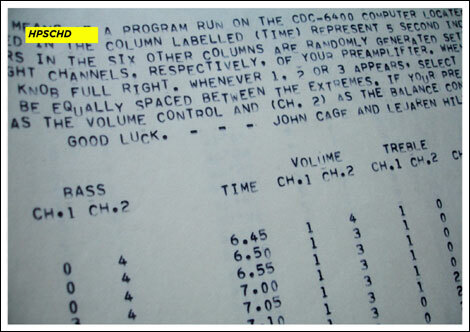 John Cage and others developed a music which increasingly tended towards interpretation in performance and experience, rather than precise 'control' of musical events, prescribed by a composer. 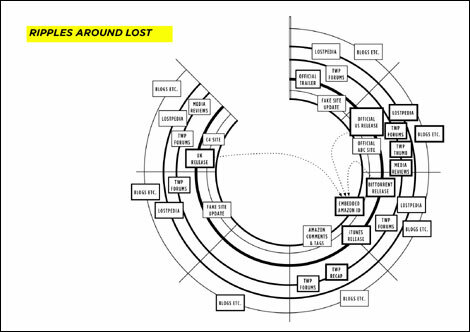 I wondered if the graphical score might be a useful way of mapping movements in media, given I was seeing an increasing complexity in their organisation, and that musical concepts like 'chordal' approach to arranging simultaneous events (see Steven Johnson's 'Everything Bad Is Good For You') seemed to be emerging. Following this through, I sketched out a graphical score to indicate how I saw some of the behaviour unfolding around a particular episode of the TV show 'Lost'. 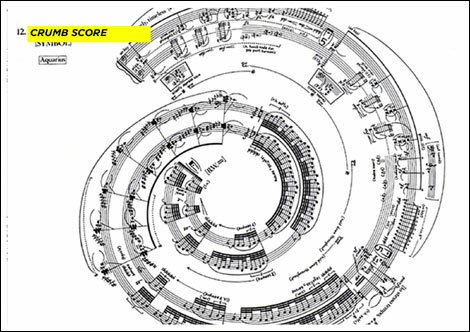 Visually inspired by a George Crumb score, it's really no more than a suggested new tool for mapping new movements in media. Its value lies in an ability to indicate an orchestration of events over time, with varying levels of interaction between particular events in particular spaces, both 'official' and 'unofficial', intended and unforeseen. This entire episode, and the way that I perceive 'Lost' is being played out, is discussed more fully in a previous cityofsound article, which in turn draws from an earlier piece around media creating 'ripples' and the social life of a broadcast. In essence though, the key points are that the producers behind Lost are seeing the entire web as the canvas for interaction around the show; as opposed to previous popular strategies of trying to own and aggregate all attention around branded portals. It's a disaggregation strategy rather than aggregation, and all the more powerful for it. 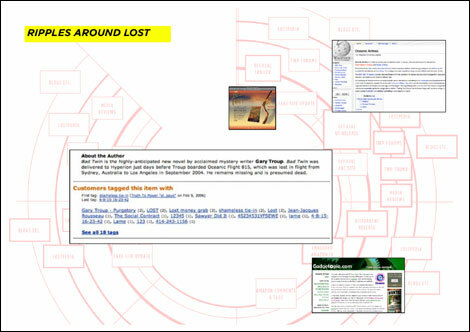 Conversation is enabled around 'Lost' across multiple portals but also fake sites, fan sites, blogs, even interaction around 'Lost' via identifier placement at Amazon.com. Assuming that some basic elements of attribution can be deployed, the rising tide of interaction around 'Lost' means that all boats rise with it, including their own. The form of 'Lost' in itself, peppered with arcana and shot through with open-endedness, suggests a lesson for garnering interaction. Again, this has been discussed more fully previously. This may not work in exactly the same way for all media, nor all programmes, magazines, books etc, but I'd suggest there's a lot that most media organisations could explore in this approach. So, moving these ideas on to other work, I'm working on a project called 'BBC 2.0', principally from the design and navigation standpoint. This work will help define the evolution, character and eventual shape of the BBC's interactive services, focusing on internet, from now to 2009. I'm exploring related concepts to those above, and it strikes me that another way of thinking through the organisation of this kind of layered, disaggregated interaction is through the varying architectural styles visible in modern cities. 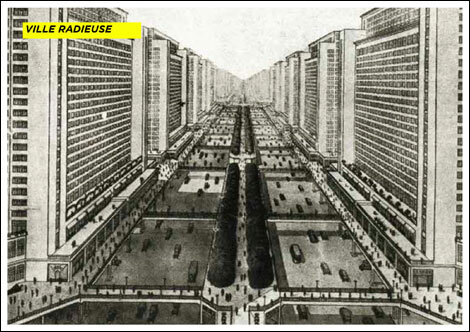 Initially we see an image of a classic, utopian modernist city - in this case Le Corbusier's unrealised 'Ville Radieuse' plan of 1935. The ordered streets and layout are optimised for rapid, efficient transit and the entire organisation is planned, controlled and carefully articulated around basic prescribed tasks. These approaches often failed, despite notable exceptions, partly as most of the plans were implemented by those with less skill than Le Corbusier, but also because many people seem to prefer an architecture they can mold, adapt and construct themselves e.g. 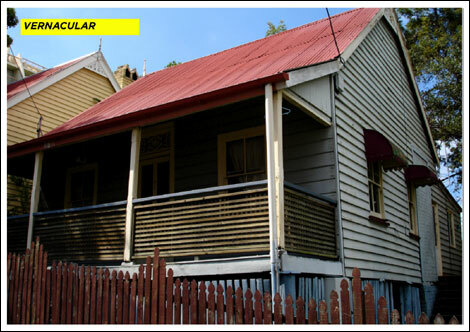 this example of vernacular architecture from Brisbane: the distinctive 'Queenslander'. The wooden struts and frames are easily replaced, the place is painted however the inhabitant wishes, most of the interior is adaptable around the user. Despite drawbacks, this adaptable architecture helps creates a personal, individual relationship between user and architecture. 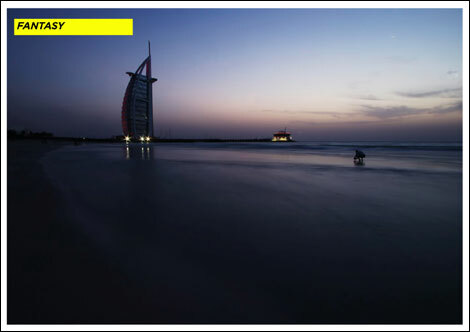 Thirdly, another interesting architectural style is that of fantasy architecture, or the folly - here as we see the Burj in Dubai, current playground for fantasists. Here we see a playfulness and sense of adventure, often not built to last or to fulfill basic functional needs, but essentially to create spectacle. 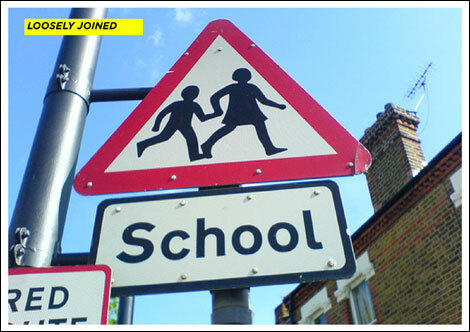 Finally, all these styles can actually co-exist, linked as they are by a basic consistency of signage; here an example from the UK's suite of consistent signage, developed from the classic Kinneir and Calvert designs. A range of architectural styles is possible around these signs, unified by a wayfinding elements - in a sense, the Kinneir and Calvert roadsigns are a syndicated kit of parts containing wayfinding instructions. So given the above maxim of 'using the entire web as the canvas' and looking at those 'Lost' examples, I'm concluding that we need to enable order, vernacular appropriation and folly-like spectacle around all of our media. 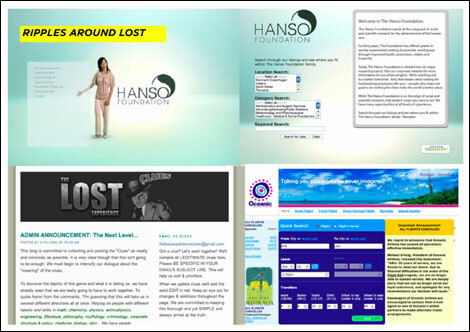 Those fake sites in 'Lost' are essentially follies or fantasy architecture - which the user will link up with the more ordered, functional sites around 'Lost'. Folding these ideas together, with a complex organisation, we needn't attempt to end up with one consistent architectural plan, design voice and indeed destination - despite the instincts of the designer to do that, it's too much pressure and too much of an ask to coherently tie all of these offerings together. Additionally it misses a trick in terms of enabling a varying range of interactive offerings. Equally, different offerings could be built under different conditions or with different properties. So we look instead to enable a richly variegated series of offerings around BBC media online, linked by consistent signage and syndication of assets, and tying together things which need to be tied together i.e. functional task-based offerings - the equivalent of the utopian city - should be unified, consistent and high-quality; the 'follies' can be allowed to float freely, to create temporary spectacle; we enable users to pull BBC content into their own highly-personal spaces, to be discussed and appropriated ... The diagram illustrates more details, benefits. 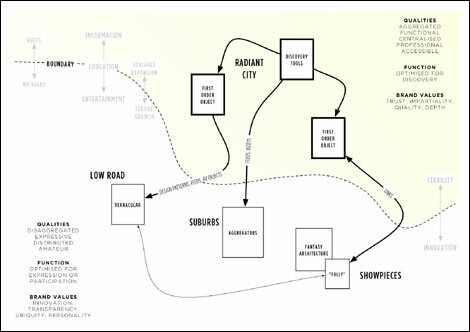 So, as well as the earlier analogy of composer/arranger, we can take a further prompt in the form of enlightened urban planning; given the wider canvas for interaction, think in terms of a richly varied city plan, only unifying that which needs to be unified, whilst also enabling vernacular, adaptive responses from citizens and creating folly and spectacle when the conditions are right. 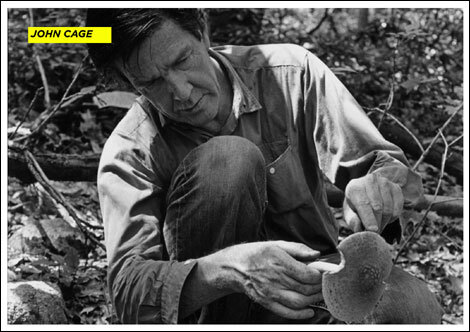 To return to music and composition, a final analogy here could be drawn particularly from the work of John Cage. 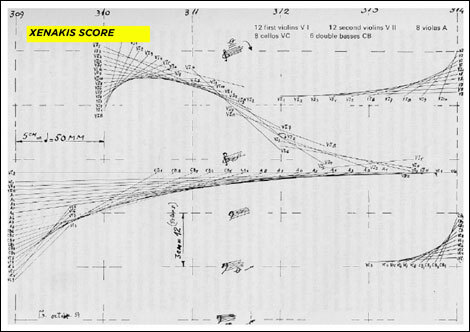 Over and above the experimental approaches to scores we saw earlier, Cage's work is particularly interesting given the highly participative, interactive nature of his composition. His work often focuses on engaging the attention of the listener - seeing them as co-performers, as co-creators in design-speak - and thus provides another useful analogy for us. 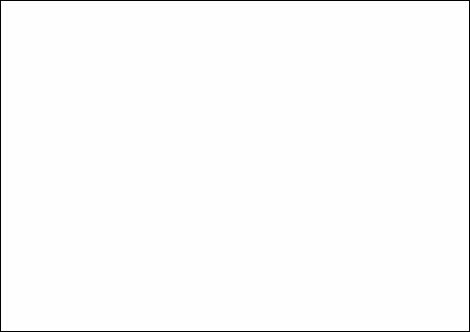 This slide is intentionally left blank to refer to Cage's most notorious work, 4'33". If HPSCHD pulled listeners into the modifying the sound of the piece, 4'33" pulls listeners into co-creating the sound of the piece itself. 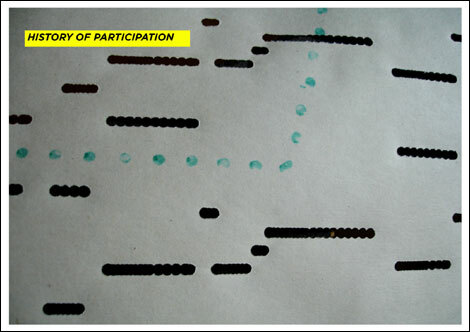 Consisting a simple set of instructions, the piece is usually performed by a pianist approaching a piano in front of an audience, lifting the lid and then not playing it for 4 minutes, 33 seconds. The sound of the piece is thus created by the noises occurring the environment around and indeed within the audience (the instructions have been interpreted and appropriated in a number of ways since David Tudor's first performance.) 4'33" heightens the audience's perception of the sound and space around them, of the sounds within them even. In the bounded quiet, focus changes, people are aware of their own interaction and (perhaps inadvertent) performance within the piece. Attention is focused and intensified; the nature of composition and performance is questioned, and a shared, communal experience emerges, in which the heartbeat and breath of everyone present is an instrumental voice within the 'music', in addition to the external environment and the acoustic characteristics of the space. I find this a more intriguing analogy for actually creating attention, as opposed to simplistic attention-seeking motives currently in vogue. Cage's work is concerned with engaging the user/listener in creating art, in participation and in heightening awareness of the self within a space or communal activity, as well as aiding the creation of attention and focus. I'd suggest these are useful ideas and examples for those of us engaged in designing and creating participative media experiences. The title of this year's Aula gathering referred to 'Movement', including a movement as a piece of music. 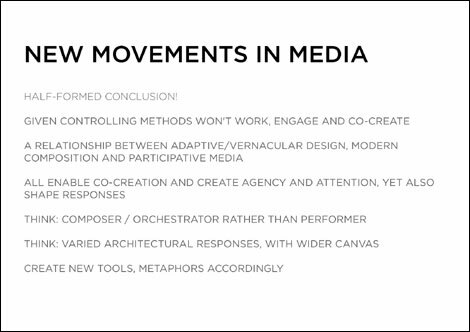 This aspect resonated with me, in terms of tracking the overlaps between adaptive and vernacular architecture, modern composition and architecture, and broadcast and interactive media. Essentially, I'm interested in overlaps between things, in the interplay between different schools of thought, on all-encompassing systems which allow for different approaches to different problems. And here, it seems there may be some interesting examples generated by forcing an overlap between adaptive or vernacular architecture, contemporary composition and media. Given that simplistically mapping systems of control from one form of media to another generally won't work, we could define a varied approach to different media, which allows each to play to its strengths, including enabling users to engage in co-creation and adaption of media. A more appropriate mindset here might be that of composer, arranger or conductor - only sometimes the sole performer. This word 'composer' implies that a particular goal is in mind, yet with an understanding that the exact conditions in which it is performed are rarely controlled. Within architecture, it means an approach of planning varying responses coherently across modernist, vernacular and follies - knowing which architectural style to encourage and nurture, rather than define. Knowing how to create conditions which can evolve over time and through use and adaptation by users. This doesn't deny modernism or new urbanism; rather it suggests that each approach has their place. Ultimately, all these approaches attempt to genuinely engage the user in creation and adaption, emphasising their own role in this social process, without losing the directive role and expertise of the composer, architect, designer or producer. Developing this approach, perhaps attention can be created or heightened, from which business can be done. But let's not merely seek attention; instead let's think creatively about this process, perhaps even as Cage and others have done.